Our safety floor markers provide high visibility, safety instructions on entering manufacturing or assembly facilities, machining shops, warehousing and distribution centres. These graphic signs provide access information, traffic flow, hazard warnings (slippery floors and steps), housekeeping and the requirement to use personal protective equipment in designated areas. These are suitable for use on clean, sealed floor surfaces, and are a tough PVC construction, with a slip resistant surface, and an aggressive adhesive, suitable for withstanding traffic flow. They are resistant to chemicals and most conventional cleaning materials. Wear protective footwear beyond this point symbol and text floor graphic marker. Pedestrian route symbol and text floor graphic marker. No smoking symbol floor graphic marker. No smoking beyond this point symbol and text floor graphic marker. No entry to unauthorised persons symbol and text floor graphic marker. No pedestrian access symbol and text floor graphic marker. No exit symbol and text floor graphic marker. Fork lift truck prohibited symbol floor graphic marker. Fork lift trucks prohibited beyond this point symbol and text floor graphic marker. Caution slippery surface symbol and text floor graphic marker. 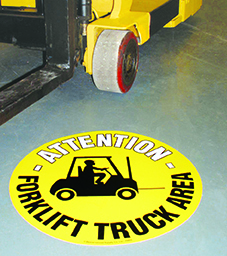 Danger fork lift trucks operating symbol and text floor graphic marker. Fire exit keep clear symbol and text floor graphic marker. Wash you hands symbol floor graphic marker. Stop, clean your hands symbol and text floor graphic marker. Head protection must be worn beyond this point symbol and text floor graphic marker. This is an ear protection zone symbol and text floor graphic marker. Foot protection symbol floor graphic marker. Wear head protection symbol floor graphic marker. Wear ear protection symbol floor graphic marker. Fire exit symbol and text floor graphic marker. Safety starts here symbol and text floor graphic marker. First aid symbol and text floor graphic marker.